The 2018 Homecoming festivities at Adrian Wilcox High School begin at 12:45 p.m. on September 28 with “Mystical Cities” — a themed parade of marchers, automobiles and, this year, class floats made with a nod to conserving natural resources. Each class chose its mystical city: seniors, Wakanda from “Black Panther;” juniors, Asgard from “Thor;” sophomores, Olympus; and freshmen, Alice’s Wonderland. The float building, open to all students, will be completed in the Wilcox quad from 3 p.m. to 11 p.m. on September 27. The 2017 Homecoming parade was disrupted by students and faculty protesting the environmental wastefulness of the materials used in float building then later discarded in the trash — from 10,000 to 20,000 pounds of trash according to the estimate of Santa Clara Unified School District (SCUSD) Environmental Science Teacher on Special Assignment Steven Sanders. Members of Sanders’ advanced placement life science class at Wilcox participated in the 2017 float protest. 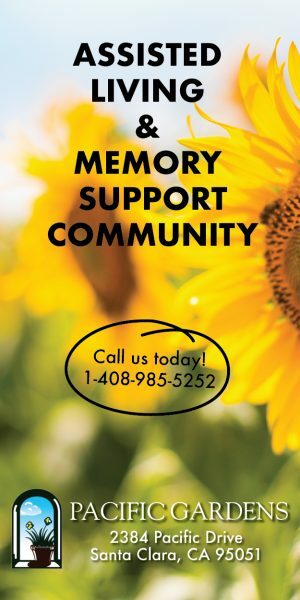 They hoped to raise awareness of the issue and create a critical dialogue about making floats in line with environmental sustainability or, ideally, eliminating class floats altogether and replacing the Wilcox tradition — dating from 1963 — with an environmentally-friendly Homecoming tradition. 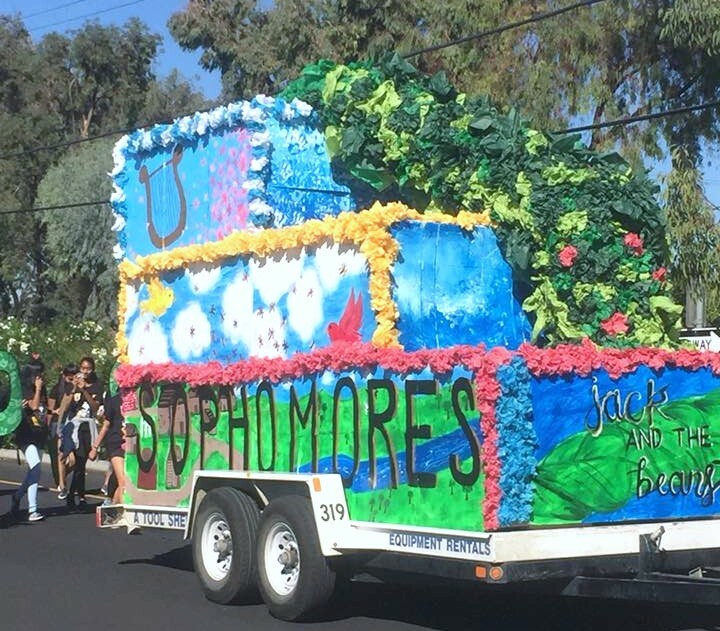 In the aftermath of the 2017 Homecoming parade disruption, which blocked the floats from proceeding along the parade route, the school engaged over the 2017-2018 school year in opinion-gathering surveys, forums and meetings on the issue. The majority of the 830 respondents to student polls and meetings (out of a student body of almost 2,000) wanted to continue float building as a part of Homecoming. A May 9 meeting open to the Santa Clara community was attended by students, parents, faculty and SCUSD representatives. Then at the end of the school year, after considering the received input, student leaders and the administration came up with modified float construction guidelines which, though somewhat more environmentally-conscious than previous guidelines, are mainly recommendations rather than requirements. Recycled materials and wood donations for the float bases, to be reused for at least two years, are strongly encouraged. Tissue paper use is limited to 2,000 sheets. Each class is asked to create a log of expenses and supply consumption. Sanders believes that the modified construction guidelines are but the beginning of needed change. He pointed out the difference between a “stewardship world view” mindset, in which people do things as long as they clean up after themselves, and an “environmental wisdom world view,” in which people don’t damage the environment in the first place. “We hope this is the beginning of making this great Homecoming tradition into a modern version — one that celebrates sustainability,” said Sanders. The 2018 Homecoming parade starts from behind the science building of the Wilcox campus, 3250 Monroe St. The floats and Homecoming Court presentation takes place between the 4:30 p.m. Junior Varsity football game and the 7 p.m. Varsity game against Palo Alto. 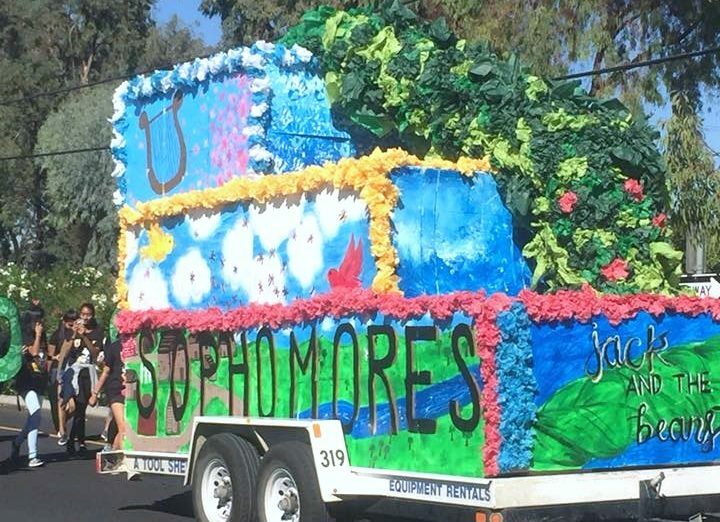 Santa Clara High School Homecoming, complete with class floats, is October 19.